If you love comic books and want to read them on your computer, you would probably have to deal with CBZ files. Basically, this is a ZIP archive with images, which appears to be a perfect container for the comic books. The only problem is that this type of the files wouldn’t be opened with standard in-built programs, and you will have to look for a CBZ reader to view them. Icecream Ebook Reader is a solid program for opening, managing and reading CBZ files on your computer. For more information about how to read a CBZ file, read the article below. 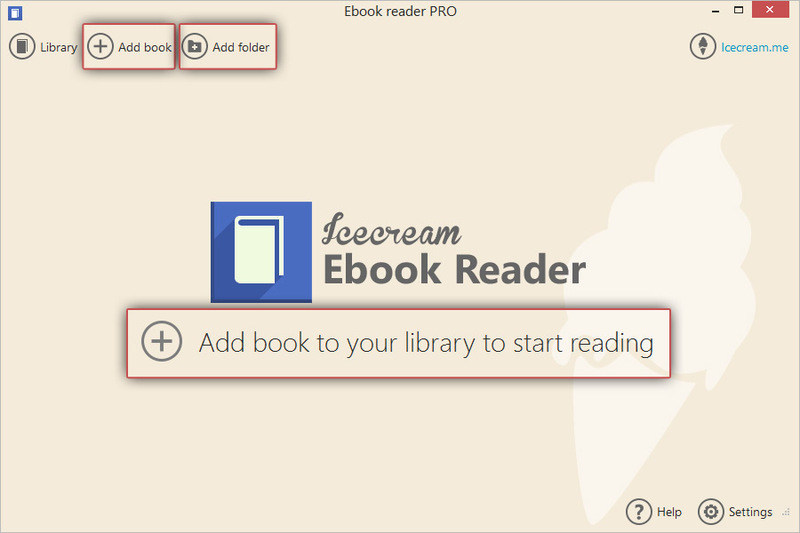 To download Icecream Ebook Reader onto your computer, simply click the “Download” button and save the installation file. Then, run it to start installing the program. Typically, the process takes about 30 seconds. Once it’s installed, open the ebook reader to start working with your CBZ files. Firs, you should add a CBZ file to the program. To do that, click the “Add book to your library to start reading” button in the middle of the main window of the CBZ reader or the “Add book” button in the upper left side corner of the program. Use Windows Explorer to find a necessary book and press “Open”. After that, the book will show up in the Library (click the “Library” button in the upper left corner to view it). Bulk addition of CBZ files is also supported by the program. 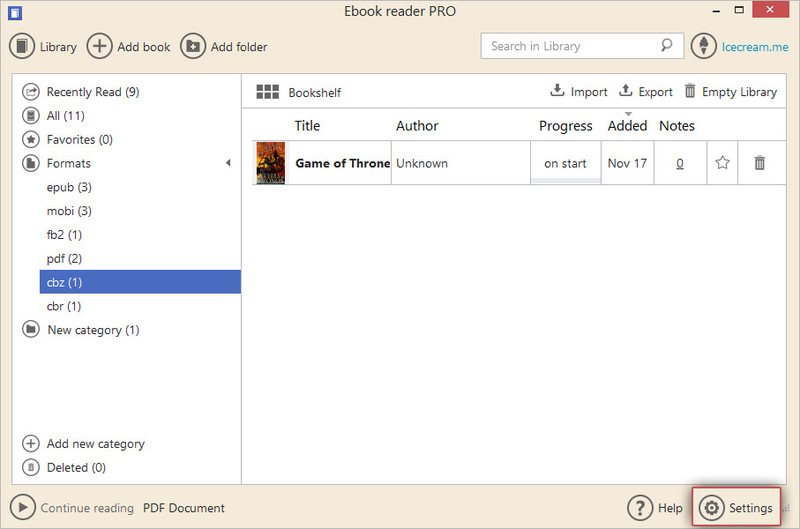 Press the “Add folder” button that is placed to the right of the “Add book” one in the upper left side of the program's window. Both the folders and the separate files can be added to the Library of Icecream Ebook Reader with the help of the drag and drop mechanism. 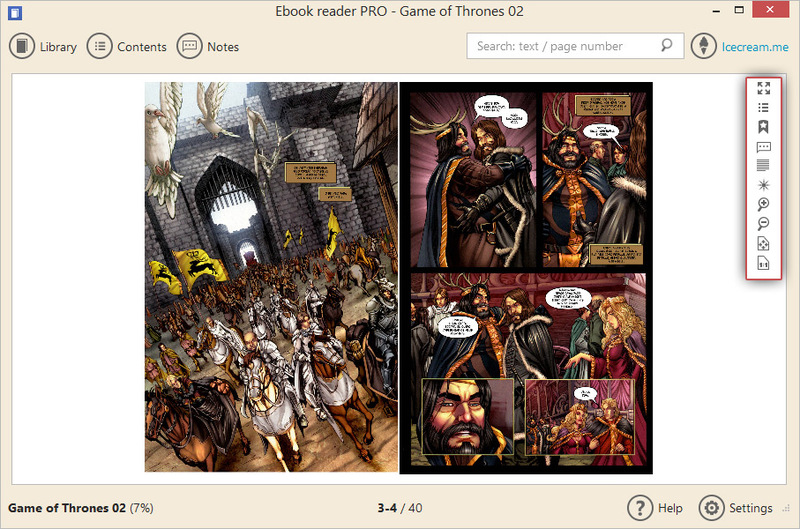 Add all the CBZ files that you wish to read to the ebook reader's Library. To access the Library itself, press the corresponding button in the upper left hand side corner of the program. The Library can be reviewed in 2 modes: Table view (title, author, progress, date when the book was added, and number or the existing notes and highlights displayed as a chart; functionality to add a book to Favorites and delete a book from the Library is also featured) and Bookshelf (displays the books as large thumbnails of the books' covers in a grid). To switch to an alternative mode, click the icon in the upper left corner of a working area. The program offers a number of convenient filters to make the search and sorting of the books in the Library easier. Thus, you can filter the books in your library by the following categories: “All”, “Recently read”, “Favorites”, and “Formats”. When you hit the “Formats” button, you can see all the formats the books of which are already in your Library. To see all your CBZ files click the “cbz” option. The “Add new category” option that can be found in the lower right hand side of the ebook reader's window is for the creation of the user's custom categories. The categories can be renamed or deleted. You can add the books to the categories for easier sorting of your Library's content. The “Deleted” option opens the folder with the books that were deleted from the Library. The books can be restored back to Library or completely deleted from here. Both of these actions can be applied either to an individual book or to all the books placed here. Now, you’re all set and ready to read a CBZ file with Icecream Ebook Reader. To turn the pages, use the direction keys or Page Up/Page Down buttons on your keyboard. Alternatively, click the Table of contents icon in the upper left side corner of the window while in reading mode, select the page, and press the “GO TO” button. Also, click the right and the left sides of the pages to turn them forward or backward. View the CBZ book in scale 1:1. You can also see your reading progress on the bottom of the page. Hit the “Settings” button in the bottom right corner to go to the Settings panel of the CBZ reader. The full list of the offered features and options of the panel with the precise description can be found in this guide.